"The Chrysalis Secret" is Andrea Freschi's fourth work and comes after the self-released "Outfall" and "Insomnie" (both recently re-issued as a full-lenght disc by Silentes), and "Obstacles", which was released in Japan by Deserted Factory. 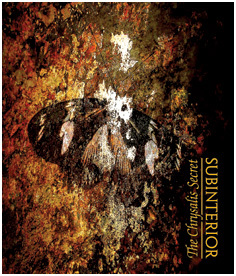 The album clearly showcases Subinterior's skills at creating good dark atmospheres and it's another step forward in his music career. These recordings were massively processed and assembled using computer technology and softwares, and turned into the finished work. "The Chrysalis Secret" is a long evocative track divided in three parts. The journey begins with a sort of repeated bell-like sound which is soon backed by an unsettling and obsessive echoed pad. Along the road we encounter deep drones - both of a windy and metallic nature - and abstract textures keep on overlapping themselves creating slow but ever changing atmospheres, like an infinite serie of reflections created by subtly different distorting mirrors. Sometimes the music seems to stop and drones turn into a minimalistic affaire, but suddendly melodies emerge from the background filling the air with colours for a while, just before turning back to black again. Intertwined with some isolationist passages, "The Chrysalis Secret" offers many abstract moments and more complex sections of aural psychedelia. We can't help to recommend it, even to our most demanding listeners. "A breve distanza dall'uscita per Eibon di "Speech From the Shadows", straordinario CD realizzato a sigla Konau in collaborazione con New Risen Throne, Subinterior propone su Afe il suo nuovo lavoro solista, "The Chrysalis Secret", confermando ancora una volta l'estremo valore della propria proposta musicale, e il proprio ruolo "chiave" nell'ambito dell'attuale scena dark-ambient italiana." "...a most enjoyable work along the lines of Lustmord circa 'Heresy'..."
"...non di rado assume connotazioni marcatamente oscure di stampo Lustmord, allineandosi invece nei frangenti più neutri, ai Nocturnal Emissions di fine '80..."
"I have always liked Andrea Freschi's thoroughly obscure, but increasingly elegant approach to dark ambient, and it was obvious that his skills were improving more and more... A perfect sonic equivalent of a pitch-black, starless night. Wonderful packaging as well." "Experimental dark ambient music has never sounded so good." "Very dark and ominous, but somehow still beautiful and relaxing at the same time, I can’t recommend it enough." "...si tratta del miglior dark ambient che mi sia capitato di sentire, un superamento qualitativo dei maestri del genere..."
"...strutture musicali organiche, che si sviluppano nell'antro del silenzio e vivono di vita propria. Davvero un ottimo lavoro, consigliato anche a coloro che non sono avvezzi agli abissi del genere." "The Chrysalis Secret" dispiega la sua dark ambient in tre lunghi brani. Composizioni dal taglio minimale che pigiano l'acceleratore su contesti direttamente collegati alle atmosfere brulle e dense di disagio esistenziale..."